"From Here to the Streets" combines several critical elements of reentry into one multifaceted resource. 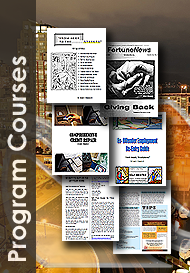 Created for corrections teachers and programs administrators, this material can be used to augment existing classes, a curriculum, or can be used as a stand-alone evidence based program for inmates or family members. The books can be downloaded, printed and mailed into any facility. For those inmates fortunate enough to have Internet access, the books are in PDF format and are easy to use. All books and articles are free for use by anyone in need; all we ask is a letter be written to tell us who you are and how you benefited from our resources. The 2012 revised edition offers up-to-date information on Credit, Business Ownership, Employment, Interviewing Strategies, Resume Drafting, Personal Finance, Federal Bonding, and Work Opportunity Tax Credits.